"House Call: Book One of The Promethium Exchange"
Dr. Doom tricks Kitty into taking him to Limbo. As Meggan is making the rest of the team breakfast, Dr. Doom arrives, seeking Kitty's help in traveling to Limbo to acquire a metal known as promethium, which could provide inexhaustible energy to the world for all time. 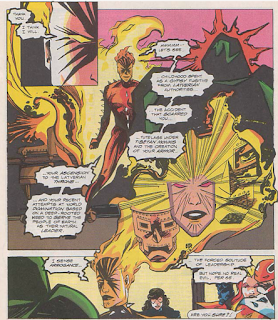 Excalibur is suspicious, but Doom allows Rachel to read his mind and she discovers no presence of real evil, so Kitty agrees to help. Drawing Illyana's Soulsword, Kitty opens a portal to Limbo and, with the help of Dr. Doom's sorcery, travel there, followed surreptitiously by the rest of the team. In Limbo, the pair is attacked by demons, and Doom grabs the sword from Kitty, fighting them off but revealing that he only intends to provide the promethium to the countries which swear allegiance to him. On Earth, the west coast branch of the Avengers are approached by the Lady of the Lake, the guardian spirit of England, who, believing Excalibur to be Doom's unwitting pawns, asks for their help in stopping him and preventing the destruction of England. 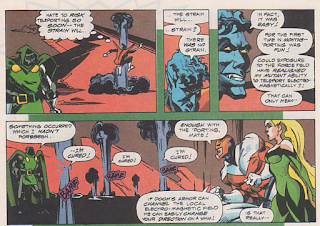 Back in Limbo, the rest of Excalibur comes to Kitty's aid, attacking Doom. 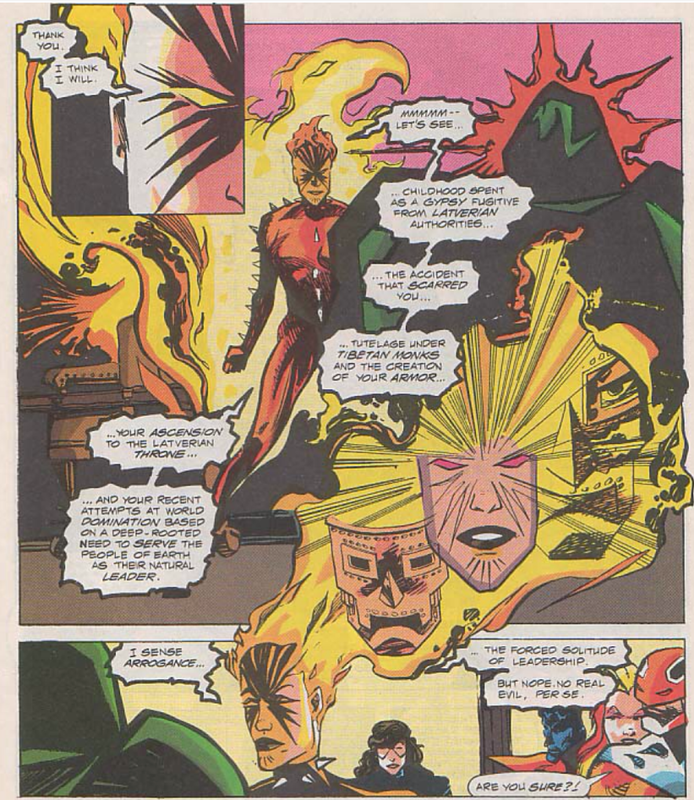 He is able to fight them all off, save for Captain Britain, who battles him to a standstill, until the pair are interrupted by demonic doppelgangers of the Fantastic Four, Avengers, and X-Men. This is the first part of "The Promethium Exchange", a three-part story featuring Dr. Doom. 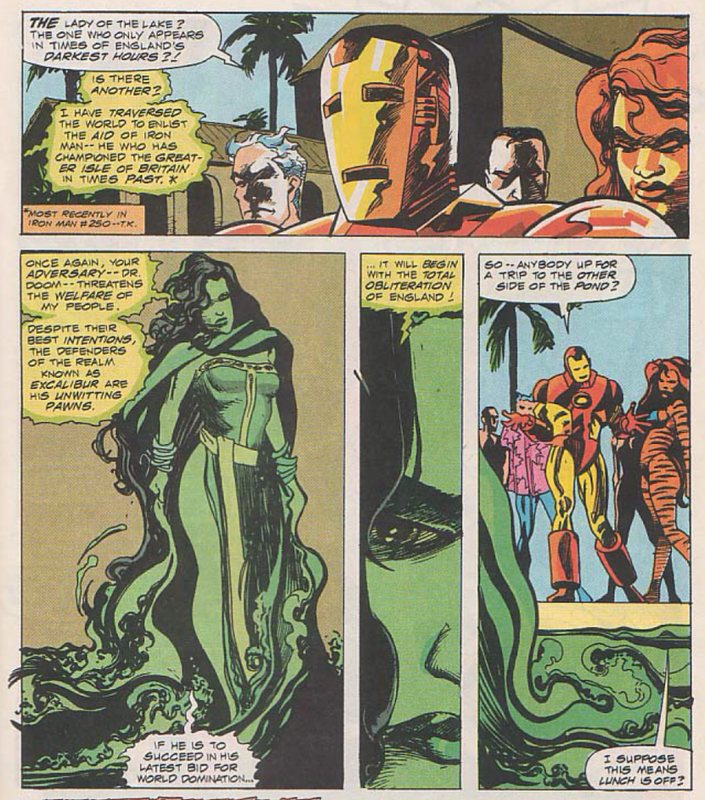 In addition to Dr. Doom, the West Coast branch of the Avengers, at this time comprised of Iron Man, Scarlet Witch, Wonder Man, Quicksilver and Tigra, appear briefly in this issue, called into service to help Excalibur battle Doom by the Lady of the Lake, citing Iron Man's past encounters with Doom (in Iron Man #150 and #250, respectively). Nightcrawler is seemingly cured of his teleportation limitations this issue, once more able to teleport multiple times in succession without suffering any physical strain. 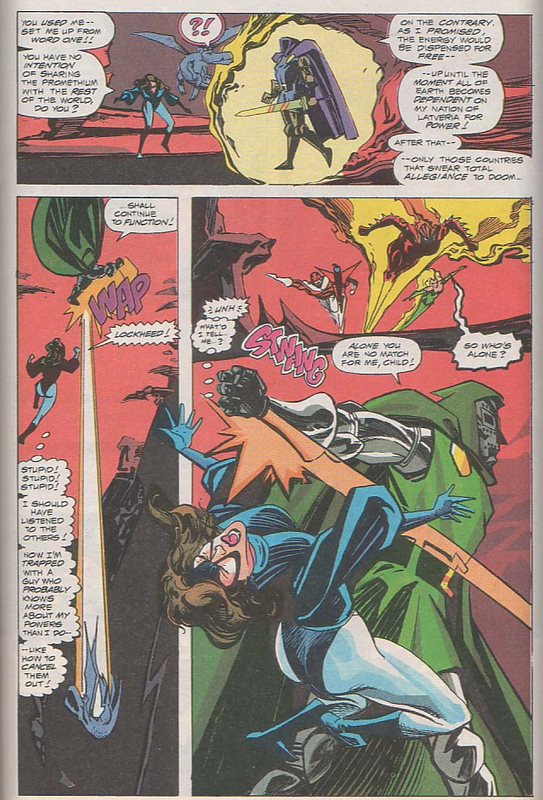 Both Dr. Doom's role in saving Kitty's life following "Mutant Massacre" (from the Fantastic Four vs. X-Men limited series) and Kitty's role as the heir to Illyana's Soulsword, post-"Inferno", are referenced in this issue. 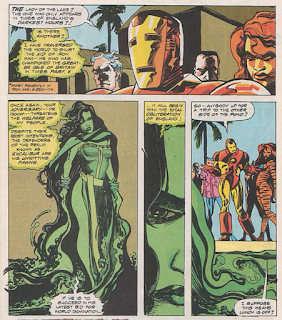 Dr. Doom appears in this story between his appearance in Avengers #331 and Fantastic Four #350. 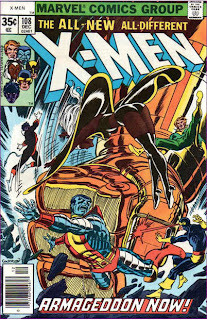 The West Coast Avengers appear between issues #74 and #75 of Avengers West Coast. Meggan says she's never cooked breakfast prior to this issue. Nightcrawler references being Meggan's tutor, something that hasn't been brought up in ages. Rachel reads Dr. Doom's mind, and claims she doesn't see any real evil. 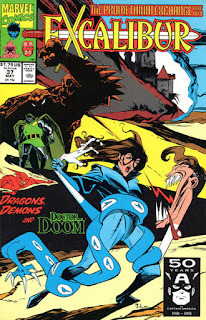 I'm certainly no Doom expert, and I know he's generally portrayed as someone who wants to rule the world for its own benefit, but I have to imagine that doesn't entirely gel with at least some things he's done in some stories through the years. The dimensional tuner Kitty created during "The Cross-Time Caper" is used to help Excalibur, via Widget, follow Kitty and Doom to Limbo. Doom rightly points out that the demonic Limbo Illyana once ruled isn't the true Limbo, as time passes there (however erratically relative to Earth time) and beings exist within it, not just shades. The Nightcrawler/Meggan flirtation is referenced briefly. Let's get this out of the way first: the art in this issue is terrible. Charitably, it could be described as "stylistic", but really, it's just a gangly mess, with characters and objects depicted in an almost abstract style, with little page-to-page or even panel-to-panel consistency in the figure work, all of which makes the whole thing borderline unreadable. The story, however, isn't half bad. Bringing in a villain from outside the series' usual rogues gallery is a pretty standard move for a fill-in story (see: Arnim Zola last issue), but Lobdell gets extra points for using one that has some shared history with the title characters. The plot also draws on the history of the series, if not resolving then at least acknowledging (and using) one of the series many lingering plot threads in bringing back Illyana's bequeathed-to-Kitty Soulsword. The presence of the West Coast Avengers (in a setup for a presumably larger role in future chapters of the story), as well as Doom, also continues Lobdell's admirable (but odd for a fill-in run) efforts to connect Excalibur to the larger Marvel Universe, moving the series out of the insular X-world a little bit more. The titular promethium, at this point, feels like little more than a MacGuffin, and Doom's sudden interest in getting to Limbo has a vaguely Macguffin feel to it as well (why NOW is he suddenly conning Kitty into taking him to Limbo? ),but otherwise, this is a surprisingly strong start to a fill-in story. If only the art was better.. Tomorrow, Elsie-Dee tries not to explode in Wolverine #39. Next week, Uncanny X-Men #277 and New Mutants Annual #7. I kind of like the art. It's quite dynamic in a weird way. The story itself reads like fan fiction when everyone including Dr. Doom are having a quip-athon, but it's hard to not like it. Special mention has to go to the end of the issue where Captain Britain goes one-on-one against Doom and it's pretty much a tie. At power level of 90 tons he hits almost as hard as Thor, which technically must position Dr. Doom and his armor as pretty much a sorcery-capable Iron Man. These Lobdell Excaliburs are actually quite good and he makes great use of the old X-Men lore in them. I continue to be surprised by how solid these issues have been. Some of it is the low bar to clear from the previous non-Claremont/Davis issues, but as a fill-in run goes, this has been surprisingly good. Lobdell’s script really surprised me, though. Its scope and sense of the characters — from Kitty’s history with Doom to him actually having a believeable enough mechanism in place to stop Phoenix and more — was really impressive, given that I don’t recall liking what little of his work I've read outside of the highly stylized first few issues of Generation X with Chris Bachalo. As the GCD index notes, by the way, #39’s lettercol states that Brad Vancata, not Glynis Oliver, did the colors for this issue. I have seen Badger's art in other places, and enjoyed it more than I did here. Even to the point that when I checked the credits, I was expecting some artist I'd never heard of before, and was surprised to see it was a name I recognized. I kind of see a pseudo Sienkiewitsch in Badger's art. And tilt your head . Mark Badger was also the artist for Batman Fortunate Son and Batman Jazz. Neither of which are particularly good. Agreed on the vague Sienkiewicz influences. Which just got me thinking we never got to see much of Sienkiewicz's take on Limbo, which is a shame.